Come out and celebrate Juneteenth with Sunrise Baptist Church family and friends on the campus grounds of Sunrise Baptist Church beginning Saturday, June 18, 2016 from 12 noon to 8 pm. Come out and spend the day while enjoying dominoe games, choirs singing, praise dancers , antique cars, motorcycles and ice cream making contest. Concessions will be available. 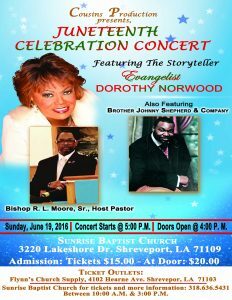 The celebration will climax with Dorothy Norwood Live in Concert on Sunday, June 19 at 5:00 p.m. Tickets $15.00 in advance; $20.00 at door.